We recently restored & made copies of this beautiful antique pendant. 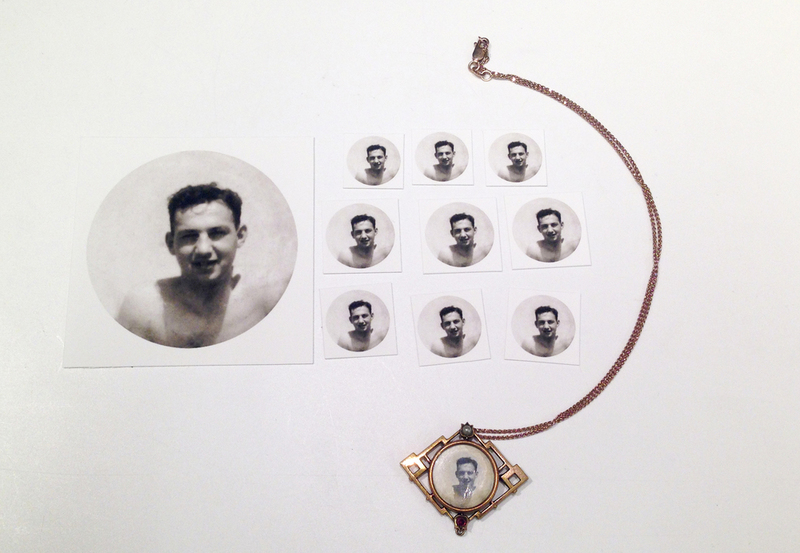 The delicate necklace was only about an inch around and held a photograph of the clients father. We were able to enlarge it to a 3x3 (seen on left) and made small copies as well. We see a lot of vintage photos here at Panopticon Imaging. They range from wedding portraits to family photos throughout the years to military portraits, the list goes on! 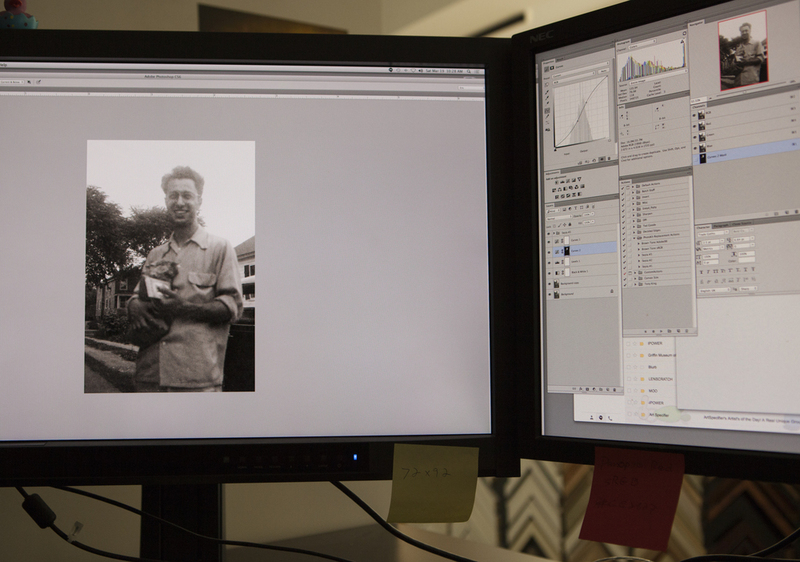 Here are the steps we go through for a photo restoration: STEP 1: Bring in your old photograph to the office. We will review the image with you & give you an estimate of how much & how long it will be to digitally restore. We DO NOT restore the original photograph. We scan it and digitally correct the image through Photoshop. STEP 2: We scan your image. Using our high resolution Epson scanner, we create a digital copy from the original photograph. STEP 3: We make adjustments in Photoshop. Here we fix cracks & damage to the image. This takes time and each photograph is different, it can take as little as 5 minutes or as much as 3 hours. We also adjust the contrast of the image, making faces lighter or certain areas darker. 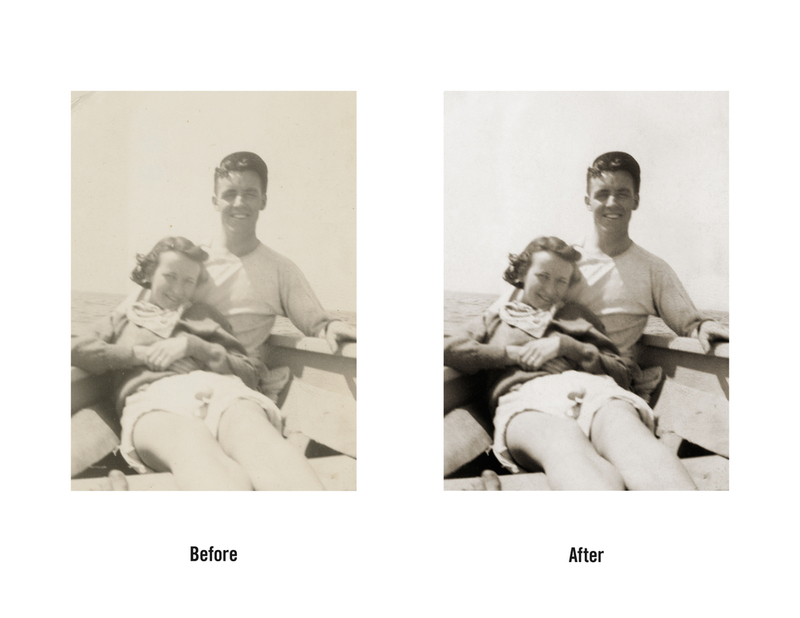 We can adjust the tone and make it black & white, sepia, or brown tone. The sepia is our most popular option, it makes the image still feel like an old photograph. STEP 4: Time to print! We use all archival inks and papers here. This means your new print will last as long as it is treated properly (keeping it away from moisture & direct sunlight). When we meet with you we will tell you the sizes we recommend printing. Most vintage photographs are small to start with so they look the best staying in the 5x7 to 8x10 size. Whatever happened to your photograph, we are happy to help bring it back to life! Stop by the office or give us a call at 781-740-1300. These restorations are getting us excited for sunny weather & beach time! Panopticon staffers received many restorations in house this month. We just had to share the number of military portraits we were able to bring new life to. It was an honor to work on them and share these brave and proud servicemen and women. This holiday season was very busy for us at the office. 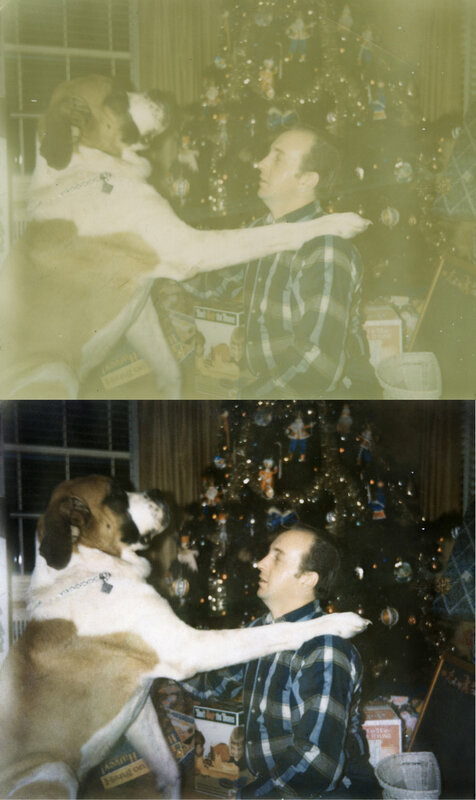 We got in so many photo restorations and started to notice a trend. As always they are sentimental images but this year was the year of the beautiful brides! We received so many we couldn't share all of them so we included a few of our favorites! We loved this restoration project!!! This was a clients mother was a actress and performer. He loved the images and couldn't wait to share them with his family. We are always up for a challenge when it comes to our restorations. We recently had a client come in with a request to repair one of the few images they had from the Vietnam War. We were able to digitally remove all of the cracks and improve the overall color. The client was very happy that were able to bring so much life back to his treasured image. This photograph was over 100 years old and was badly damaged by years of creasing and cracking. The emulsion was totally removed in many areas. Our determined Digital Techs went to work to remove all of the damage and even had to re-create a portion of the seated woman's face. It was no easy task but the image looks beautiful and the client was beyond impressed. 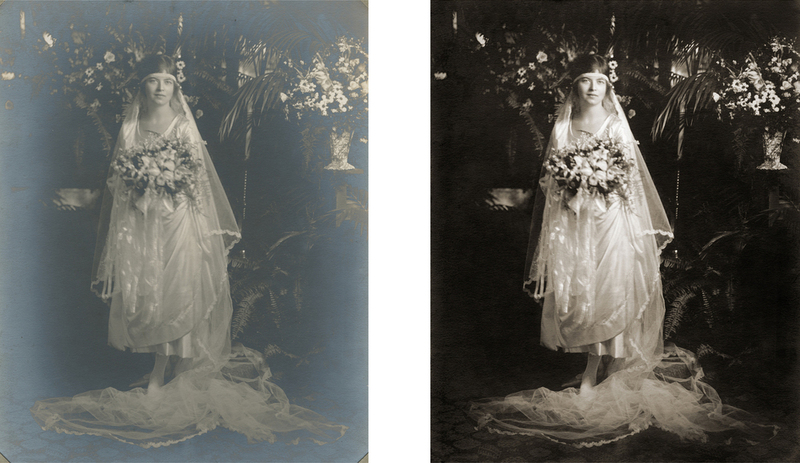 We enjoy restoring and bringing these images back from years of dust and dirt. Not only we do get to share in the history of these images but we bring new life to them for a new generation to enjoy. Stop by Panopticon Imaging or give us a call at 781-740-1300. 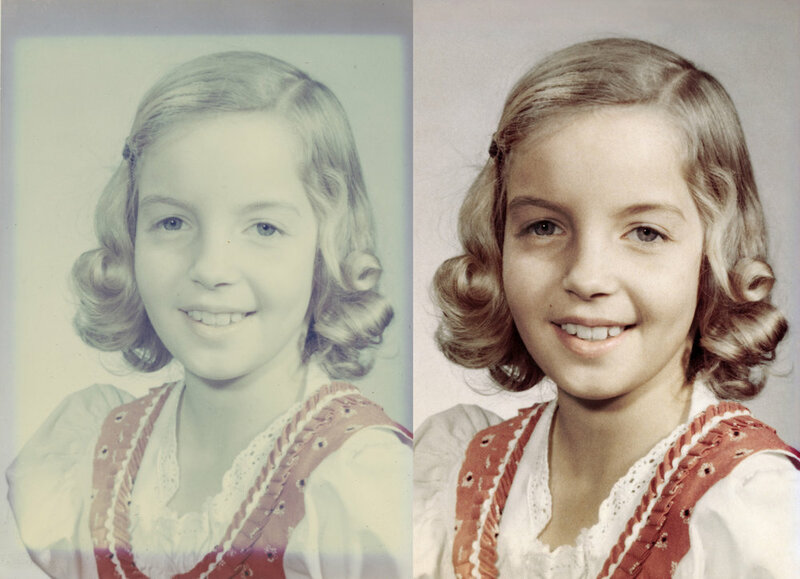 Our staff handles all levels of photographic restoration and has extensive knowledge in digital photographic repair. We can restore any print to beautiful condition even if it has been damaged by time, water, mold or environmental conditions.